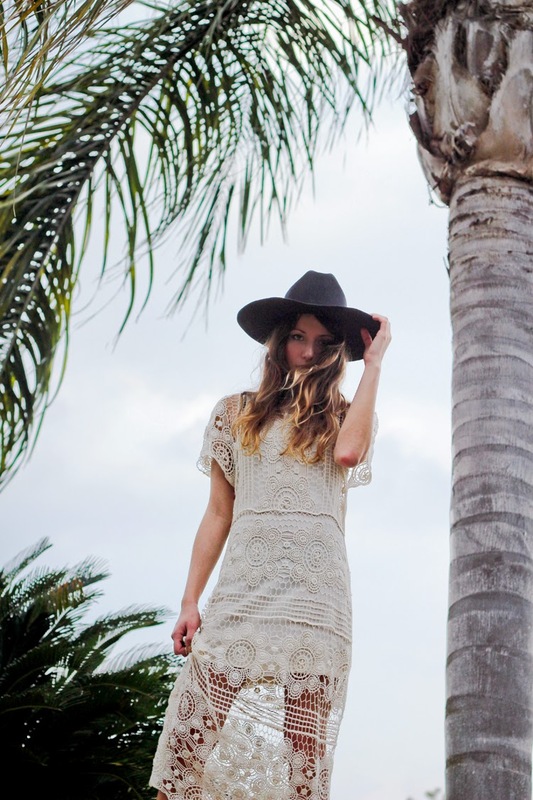 Forever 21 crochet maxi dress, Vintage cowboy hat, Sam Edelman cowboy ankle boots (similar here). Shot in Houston by Isaac Lacey. As some of you might know, I spent two weekends ago in Houston, Texas to visit some friends and celebrate Isaac's birthday. Having never been to Texas, I had no idea what to expect, but all I really cared about was the fact that the weather would be in the 60's-70's, allowing me to bring out all my Spring clothes that I haven't yet had the opportunity to wear in NYC. That includes this crochet dress, which I'm sure I'll be living in come (actual) Spring. I love the ornate crochet pattern, and when donned with a cowboy hat and boots I really felt like I blended in down South. If you're heading to Coachella or doing the festival circuit, I highly recommend getting a detailed dress like this one! It's a surefire style-statement, and will also let you breathe and air out while you're dancing the day away. What a beautiful dress! it's the perfect summer piece!! Can not wait for warm weather!! it's killing me!! I love love love this dress.